Boot season is back, baby! One of my favorite parts of fall is dusting off my little collection of cute, comfy boots. It’s always a bummer to pull out a favorite pair and find scuffs and scratches. Or just realizing that last season’s boots might be a little blah for this year. 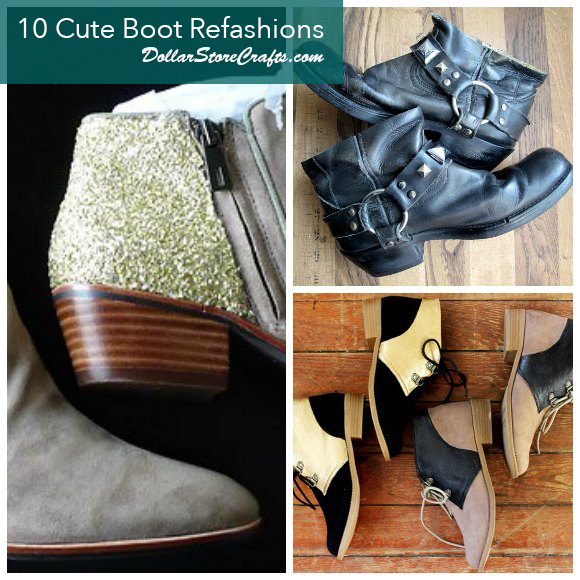 Instead of going shoe shopping, try some of these ways to refashion those old boots. 1. Glitter Boots – A pop of glitter is a great way to cover up scuffed heels on an old pair of boots. 2. Pop of Color Boots – Raid your fabric stash and use your prettiest scrap pieces to add a little colorful detail to your favorite boots. 3. Color Blocked – I love how this boot refashion reminds me of saddle shoes. So sweet. 4. Gold Toes – Who says socks are the only way to sport a gold toe? Cover scuffs and scratches and add a little sparkle at the same time. 5. Lace-Covered Boots – Use a bit of lace to cover imperfections and add interest to a plain pair of boots. 6. Polkadot Rain Boots – Make your puddle-stomping a little bit cuter. 7. Removable Bling – Give your combat boots a glam touch without committing with this removable embellishment. 8. Western Faux Steel Toe – This is a more stylized take on the color-blocked toe, and it’s so cute! 9. Studded Ankle Boots – Trim and transform your boots into trendy ankle boots with a little bit of a hard edge. 10. Cut Out Boots – Take a pair of tall boots from modest to sassy with an X-acto knife. I reblogged this, this is super cool!